Over the weekend, I was fortunate enough to visit Tirana again for their first Debian Bug Squashing Party. Every time I go there, female developers (this is a hotspot of diversity) ask me if they can host the next Mini DebConf for Women. There have already been two of these very successful events, in Barcelona and Bucharest. It is not my decision to make though: anybody can host a MiniDebConf of any kind, anywhere, at any time. I've encouraged the women in Tirana to reach out to some of the previous speakers personally to scope potential dates and contact the DPL directly about funding for necessary expenses like travel. If you have read Elena's blog post today, you might have seen my name and picture and assumed that I did a lot of the work. As it is International Women's Day, it seems like an opportune time to admit that isn't true and that as in many of the events in the Balkans, the bulk of the work was done by women. In fact, I only bought my ticket to go there at the last minute. When I arrived, Izabela Bakollari and Anisa Kuci where already at the venue getting everything ready. They looked busy, so I asked them if they would like a bonus responsibility, presenting some slides about bug squashing that they had never seen before while translating them into Albanian in real-time. They delivered the presentation superbly, it was more entertaining than any TED talk I've ever seen. The event was boosted by a large contingent of Kosovans, including 15 more women. They had all pried themselves out of bed at 03:00 am to take the first bus to Tirana. It's rare to see such enthusiasm for bugs amongst developers anywhere but it was no surprise to me: most of them had been at the hackathon for girls in Prizren last year, where many of them encountered free software development processes for the first time, working long hours throughout the weekend in the summer heat. A major highlight of the event was the presence of Jona Azizaj, a Fedora contributor who is very proactive in supporting all the communities who engage with people in the Balkans, including all the recent Debian events there. 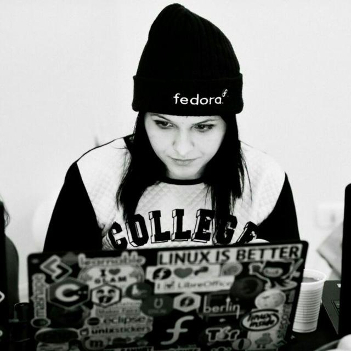 Jona is one of the finalists for Red Hat's Women in Open Source Award. Jona was a virtual speaker at DebConf17 last year, helping me demonstrate a call from the Fedora community WebRTC service fedrtc.org to the Debian equivalent, rtc.debian.org. 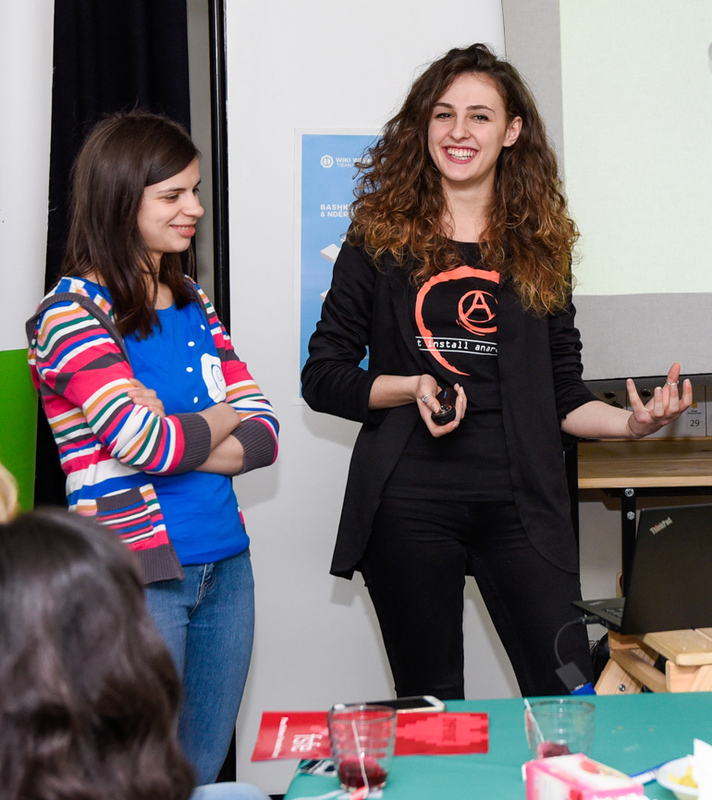 At Mini DebConf Prishtina, where fifty percent of talks were delivered by women, I invited Jona on stage and challenged her to contemplate being a speaker at Red Hat Summit. Giving a talk there seemed like little more than a pipe dream just a few months ago in Prishtina: as a finalist for this prestigious award, her odds have shortened dramatically. It is so inspiring that a collaboration between free software communities helps build such fantastic leaders. With results like this in the Balkans, you may think the diversity problem has been solved there. In reality, while the ratio of female participants may be more natural, they still face problems that are familiar to women anywhere. One of the greatest highlights of my own visits to the region has been listening to some of the challenges these women have faced, things that I never encountered or even imagined as the stereotypical privileged white male. Yet despite enormous social, cultural and economic differences, while I was sitting in the heat of the summer in Prizren last year, it was not unlike my own time as a student in Australia and the enthusiasm and motivation of these young women discovering new technologies was just as familiar to me as the climate. Hopefully more people will be able to listen to what they have to say if Jona wins the Red Hat award or if a Mini DebConf for Women goes ahead in the Balkans (subscribe before posting).